For Joshua, trucking is the dream job and one he's fighting for, a true passion passed down through the generations. 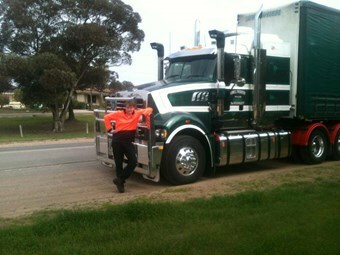 Joshua when he was a bit younger, standing proudly beside the Mack his uncle drives for Stawell Freighters. "Truck driving should be an apprenticeship," says 18-year-old Joshua Pyke, as he talks about how tough it’s been to break into the industry after finishing school in Western Victoria. Josh’s heart pumps diesel, thanks to a life around trucks and a genuine appreciation for his relatives and role models who introduced him to the industry. "I come from a family which has based its name around trucks. "My Pop was a truck driver who drove for over 50 years and raised his family around them. "The love for trucks has flowed through the generations with Pop, two of his sons Michael and Stephen and then to me. "Michael has been driving for over 20 years now, and Steven was in trucks even earlier but sadly passed away behind the wheel. Joshua’s passion stems from fond memories in his uncle’s truck, learning what he could and getting a feel for the lifestyle. "I have been travelling interstate and locally with my uncle for eight years observing and learning the basics of the truck driving lifestyle and it’s grown on me quite a bit. "I have realised it is a career I would love to pursue as I enjoy it and it’s a passion of mine. The stark reality for Joshua, is that after finishing year 12, he’s realise it’s very difficult to catch a break as a truckie when you’re young. Despite receiving a promising university offer Joshua decided truck driving is a dream worth fighting for, prompting him to defer and take on a labouring job while he saves for his HR licence. "I have looked around and have seen ads for companies needing drivers and one thing they all have in common is they want drivers with 2 or more years’ experience minimum behind the wheel. "I do agree in a way with how difficult the job is, but how are we meant to accommodate for a shortage of truck drivers? "How are we going to introduce people into the driving sector of the transport industry?" Joshua thinks the solution might be an apprenticeship for aspiring truckies, and it’s a sentiment commonly uttered throughout the industry. "Drivers need to learn how to operate the truck in different situations, operate forklifts, learn how to load and learn different restraints needed for variety freight - this takes years of experience and practice. "What does this mean for a person like me who want to drive trucks? "I think this would be much easier through apprenticeships or traineeships, because it would have more structure for people wanting to learn and work in the transport industry, and could possibly be more appealing to young people like me wanting to enter this industry. Get in contact with Owner Driver through the Facebook page if you would be interested in giving Joshua a truckin' go.